Greater Manchester Bus route 58 is operated by First Greater Manchester between Rochdale and Middleton bus stations via Milnrow, Newhey, Shaw & Crompton, Oldham and Chadderton. It has a sister route 59 which operates on the same route between Middleton and Shaw, and also serves Rushcroft. Route 58 was originally operated by GM Buses and operated on almost the same route as today. Evening services previously operated between Rochdale and Newhey, provided by Rossendalebus and Bu-Val Buses, although these journeys are now covered by routes 181, 182 and 451. The route has had some variations in the past. The service previously ran to the Trafford Centre via the M60 motorway until August 2008, where it was replaced by route 57 between Oldham and Trafford Centre (57 was withdrawn in January 2010)). The service was extended from Middleton to Bury Interchange on behalf of Transport for Greater Manchester in October 2009, but this was withdrawn in July 2011. Buses leave from stand J at Rochdale Interchange before heading along Milnrow Road (A640) towards Firgove, where the road changes name to Rochdale Road. Buses turn off the A640 into Milnrow town centre via Bridge Street, Dale Street and Newhey Road. The service continues along Newhey Road as it returns onto the A640 to Newhey. Once in Newhey, the 58 branches off onto the A663 Shaw Road as it heads into the Oldham area, heading past Dunwood Park into Shaw & Crompton. The service turns off the A663 into Shaw town centre via Milnrow Road, Market Street and High Street before returning to the A663 Crompton Way at the Big Lamp roundabout. The service then heads towards Oldham via the B6194 travelling through Heyside and Higginshaw, passing close to Salmon Fields. At the junction of the B6194/A62, the service turns onto the A62 to head to the Mumps junction and Oldham Mumps Metrolink station. At this point, the service leaves the A62 and runs through Oldham town centre with the service taking two routes between Princes Street at Mumps and the bus station. Westbound buses run via Union Street, Clegg Street (former bus station), Yorkshire Street and St Mary's Way, while eastbound buses run via St Mary's Way, Lord Street, High Street and Yorkshire Street. Leaving Oldham bus station, buses travel along Middleton Road (A669) through Westwood, Chadderton and Firwood Park. 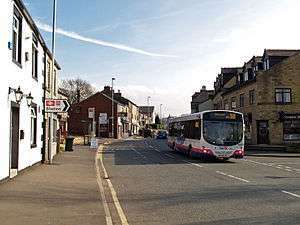 Buses then go past Mills Hill railway station where the A669 road renames to Oldham Road as the service continues to Middleton and terminates at the town's bus station. The main type of vehicle used on journeys on route 58 are Volvo B9TL's, which have route branding for the 58 and its sister service, the 59. The main alternative vehicle used on the route is Volvo B7RLE's, which were the previous prominent vehicle on the route. ↑ "All change on the buses". Oldham Evening Chronicle. 27 August 2008. Retrieved 12 September 2012. ↑ "Service Changes Information August 2008" (PDF). FirstGroup. FirstGroup. Retrieved 12 September 2012. ↑ "Service Changes Information January 2010" (PDF). FirstGroup. FirstGroup. Retrieved 12 September 2012. ↑ "Service Changes Information October 2009" (PDF). FirstGroup. FirstGroup. Retrieved 12 September 2012. ↑ "Service Changes Information July 2011" (PDF). First Group. FirstGroup. Retrieved 12 September 2012. ↑ "Rochdale bus station - Destination Finder" (PDF). TfGM. Transport for Greater Manchester. Retrieved 12 September 2012. ↑ "Network Maps". TfGM. Transport for Greater Manchester. Retrieved 12 September 2012. ↑ "58 59 timetable" (PDF). TfGM. Transport for Greater Manchester. Retrieved 12 September 2012. ↑ Flickr. "First Manchester 37546 Volvo B9TL MX09 GYJ". Retrieved 12 September 2012. ↑ Flickr. "First Manchester 66867". Retrieved 12 September 2012.